Over the past two years Lodge Security has been operating its Elite Store Detective programme from the LodgIC Intelligence Centre, where national and local data on crime incidents is analysed and used to deploy protection to produce the maximum return on security investment. 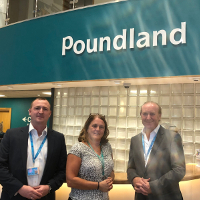 Poundland and Lodge are now examining new opportunities to deploy other technology that is available from the intelligence centre. This includes the capability to analyse retail transactions through the use of Transpeye for data mining of EPoS, online transactions and other store systems, to then identify any sources of loss in real time and the relationships between apparently isolated incidents. Lodge can then analyse and track any patterns of criminal activity, to enable the investigative team to attribute recurring losses to known criminals and gangs, who can be identified from in-store CCTV recordings. Perpetrators are then stopped in-store by Lodge Security detectives. In many instances Lodge has been able to track a gang’s activity around the UK and assess the probability of where and when they might strike next. “Retailers are increasingly alert to the scale of the threat from Organised Retail Crime. A string of small, seemingly unrelated criminal acts are often committed by the same gang; if they think they can get away undetected each time they will keep coming back. “Through the blended use of our specialist teams in the field and technology, our intelligence centre is quickly able to map related losses and then stop them fast,” says Stuart Lodge, CEO of Lodge Service International, a third generation family-run business that celebrates its 100th anniversary in 2019.